The Best Looking Dress Shoes under $125? Ships free with the code SHIPR after you join their email list. If you like your dress shoes sleek, leaning modern, and don’t wear them every single day, then keep on reading. If your prefer a more conservative look, shun even slightly elongated toes, and your idea of sexing it up is to set aside your 360 welt Park Avenues for an evening in favor of a slightly trimmer 270 welt Lombard , then go ahead and skip this one. There’s a huge void in the men’s shoe market. You just can’t find a non clunky, simple, closed lacing leather-sole dress shoe for under $150. Everything is either a fat Bostonian or some ridiculously over embellished Steve Madden. These true oxfords from DSW’s house brand Mercanti Fiorentini might be one of the only options that actually fills that void. They’ll get a solid A in the looks department from those that prefer a trim European silhouette, but they’re more like a B or B- when it comes to construction. Despite the always welcome “Made in Italy” stamp, the leather isn’t top notch (might be bicast?) but it looks plenty good from a few feet up. The soles are leather, but they appear to be glued and not sewn to the uppers. That’s pretty standard for a shoe that costs around $120, but DSW’s “compare at $250” is way too generous. They look clean and Italian, because they are clean and Italian. No superfluous lines or embellishments, and the slim shape is more than able to carry the style load. Although they wrinkled a bit across the toe after the first wear, it’s really not that noticeable. The fit seems true to size and they’re decently comfortable. They’ve also been added to the long term test pile so we’ll see how they hold up, but the first impression is a good one. These might be about as good as it gets for those who lace up dress shoes 5-10 times a month or less, and don’t want to take out a second mortgage to land a pair of streamlined eye catching dress shoes. I don’t see them mentioned around here, but I am a huge fan of Stacey Adams shoes. I love the fit and comfort and I’m a big fan of the square toe. The shoes are typically less than $100 and I’ve often found them on sale for $50 or less. They shine up nicely and look great with slacks or a pair of jeans. I bought my first pair about ten years ago and just bought three pair to replace some old ones that were about worn out. Actually, I’d say that is my only complaint about them- they don’t hold up super-well. For the price, though, I hardly cared. I purchased these shoes a while ago. Unfortunate but true, I wore them to a funeral and I noticed I had the nicest shoes on out of everyone. These shoes look great, they feel great and seem to be made of good quality. They are extremely slippery on carpet when new! Scuff em up a bit and score yourself some cedar shoe trees with these puppie. I loathe square toes. And for what it’s worth, they are nearly universally loathed on Style Forum and Ask Andy as well. I think it’s rather telling that Allen Edmonds doesn’t produce a single last/shoe that could possibly be considered square-toed. I gotta shun the elongated toes on these Mercantis… size 14 of anything look clowny enough as it is. I don’t presume to speak for him, but I’m pretty sure Joe doesn’t care for square-toe shoes as well. Love, love, love them. I hope the supply lasts for a month or so. What kind of shoe would you recommend for someone that’s size 14? I’m looking to pair a more modern shoe with an indochino basic black two button suit for my wedding. I’d just go with your run of the mill black cap toe/oxford. If you want to add some substance and flair, maybe a brogue/wingtip. Anything that is form fitting to your foot, so it doesn’t add unnecessary length or width to your foot. I don’t have a great rotation of shoes yet (I’m in the transition from college to a real job right now), but I’ve got one pair of black cap toes, one pair of brown cap toes, and one pair of brown wingtips. If you want to go high quality, go with Allen Edmonds Park Avenues. If you’re aiming for something cheap, Dockers Gordon is doable. X2 on loathing the square toes. No high-end shoe maker has ever produced square toe shoes that I’m aware of. I still see lawyers in Niagara Falls wearing these abominations which tells me all I need to know. 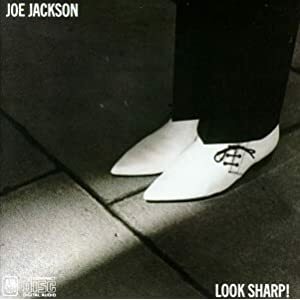 As for these Mercantis, toe is a little too pointy for my taste-venturing into Joe Jackson’s “Look Sharp” album cover territory IMHO. Nice find. Now if only they’d bring back the MK brown suede brogue! Not cheap, but, they won’t look cheap either. Also, these aren’t that pointy. If you’re a size 14, but relatively slim/in shape/don’t have oxen sized shoulders, I think these from DSW could work. There’s also plenty of size 14s on Florsheim’s site. LINK20 should still get you 20% off there. Haha great office reference! I like you even more now. Its hilarious when he rests those dogs after in the ice box at the hotel! But yes, no square toed! Wow, I had no idea square toes were so universally loathed. I guess if I like them and how they look, it doesn’t matter what anyone else thinks, but…well, dang! Lots of dislike for the square toed shoes here. Stacy Adams? Do you read the site? Have you learned nothing.square toe.,apparently not! Pointy shoes for a man with EEE feet neither look nor feel good. Since I suffer from such a malady, I’ve tried square-toed, cap-toed, oxford, and wing-tips. Unfortunately for me, the only shoes that fit comfortably and still appear dressy tend to be square-toed. I look forward to the day when modern cobblers start making comfortable shoes for the wide-footed gentleman. I have no issues if someone likes/wears square toed shoes, or any other styling for that matter. To each his/her own. That’s the beauty of personal style. Its personal. After all…its just a shoe. I just saw rhe most beautiful pair of shoes: Bostonian Vintage (Not Vantage) in brown but are running $160. I’m wondering if Boztonians are worth that price based on quality/build? I really liked this: http://www.dsw.com/shoe/aston+grey+connelly+leather+oxford?prodId=207612&category=dsw4cat70004 but when I tried it on the toe was SUPER long and didnt come down to a reasonable size until I put on an 8, which was of course too small for the rest of my feet. Should I not be doing mom’s pinch-the-toe technique to try on shoes anymore? I bought a pair of the Mercanti Fiorentini Run Off Oxfords a while back. The design is great and I like the fit a lot (I have 10 M and fits true to size), but you’ve got to be diligent about polishing your shoes regularly because the leather is incredibly soft and marks up / scratches very easily. I wear mine for work only so I’m not putting them through the ringer but they still seem to scratch up quickly. Otherwise a good purchase. I bought these shoes and love them. I bought brown first and have been trying to find them in black (11.5) but can’t find them anywhere! Don’t you just need a shoe tree to keep the creases from being annoying? Would love to get an update on how these have held up, seeing as they’re members of the long-term test pile. Perhaps it’d be nice to go through that whole pile and provide updates. Any news on when these may be coming back in stock? After reading this place for the past couple months I am completely self-conscious about my square-toed dress shoes. Looks like I might have to give these a try in the near future.